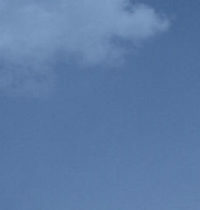 Carbon capture and storage (CCS) is essential to achieving climate change mitigation targets. It is the only feasible technology that can deliver deep emissions reductions in many industrial processes that are vital to the global economy, such as steel, cement and chemicals production. In combination with bioenergy used for power generation or biofuel production, it provides one of the few technologies that can deliver negative emissions at scale; unambiguously required to limit temperature rises to meet the Paris climate targets. While the critical role of CCS has been demonstrated in many reports, the policies in place today are insufficient to ensure CCS deployment scales up at the rate required. 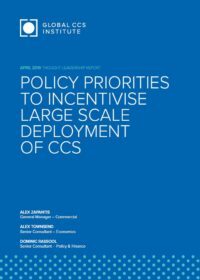 This paper seeks to address the current policy gap by describing priorities for policymakers to support the transition from current to future rates of deployment of CCS. 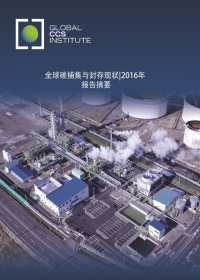 The Institute's report explores how to stimulate investment in CCS. The paper also identifies concrete policy actions and reviews the progress achieved until now by identifying the policies and commercial conditions that have enabled investment in the 18 large-scale CCS facilities currently in operation, and the additional five that are under construction. 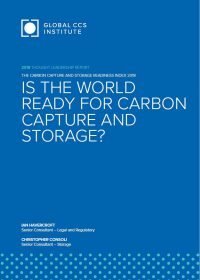 The Carbon Capture and Storage Readiness Index 2018: Is the world ready for carbon capture and storage? Collectively, our three Indicator Reports 2018 form a further, criteria-based assessment known as the CCS Readiness Index, or CCS-RI. The 2018 CCS-RI examines over 50 countries using 70 discrete criteria and enables a comparative assessment of countries globally. 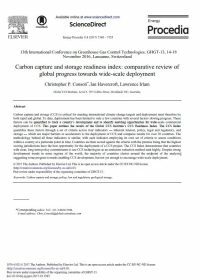 Clear from the 2018 assessment is that greater effort is required to deploy CCS at the scale necessary to meet climate change mitigation ambitions. Law and regulation remains a critical element of a government’s policy response to support the development and deployment of CCS. Robust legal and regulatory frameworks provide certainty for businesses eager to engage in innovation, and the deployment of CCS. 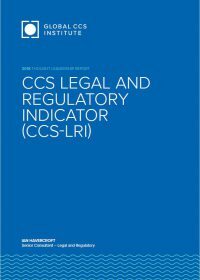 The CCS-LRI offers a detailed examination and assessment of national legal and regulatory frameworks in 55 countries and examines a range of legal and regulatory factors likely to be critical for the regulation of the technology. The availability of storage resources is the ultimate pre-requisite for CCS deployment. For global CCS deployment, each country needs to know where, and how much, CO2 can be stored. Each nation needs to characterise, explore and appraise a national portfolio of accessible, commercially-viable storage sites ready for CCS Facilities. 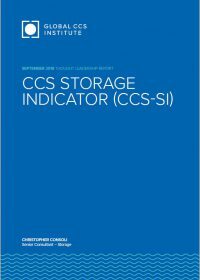 The CCS-SI tracks the development of storage resources for 80 countries. 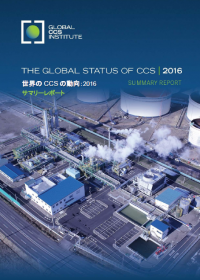 The 2018 scores confirm an overall improvement since the 2015 CCS-SI with twelve nations having mature, or near-mature, storage resources to enable wide-scale CCS. Government policy, given effect through law and the allocation of public resources, is critical to achieving climate targets. It plays a material role in determining the return on investment for any climate mitigation technology making confidence in government policy a pre-requisite of investment. The CCS-PI tracks the development of government policy to accelerate the deployment of CCS as an essential climate mitigation technology in over 100 countries. There are 15 large-scale CCS projects operating globally. Ten out of these fifteen projects, are located in North America . The European Union's (EU) stated ambition was to have up to twelve operating CCS projects by 2015 , however this goal was not accomplished. The two projects currently operating storage in the European Economic Area, Sleipner and Snøhvit, are located in Norway. Because of this disparity in the number of projects operating in North America and in Europe – ten vs. two – we have analysed business models of major CCS projects in North America and in Europe, with an aim to identify risks and enablers in CCS project financing development on both continents. We find that successful CCS project development depends on multiple factors, such as (i) clarity of regulatory frameworks, (ii) efficiency of permitting processes, and (iii) early and sustained stakeholder engagement for public acceptance. However, project finance remain the most challenging piece. Carbon capture and storage (CCS) is critical for meeting international climate change targets and deployment must therefore be both rapid and global. To date, deployment has been limited to only a few countries with several factors slowing progress. These factors can be quantified to track a country’s development and to identify enabling opportunities for wide-scale commercial deployment of CCS. This paper outlines the results of the Global CCS Institute’s CCS Readiness Index. 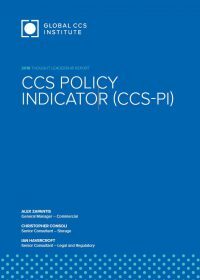 The CCS Index quantifies these factors through a set of criteria across four indicators — inherent interest, policy, legal and regulatory, and storage — which are major barriers or accelerators to the deployment of CCS and compares results for over 30 countries. The methodology behind all three indicators is similar, with each indicator employing its own set of criteria to assess conditions within a country at a particular point in time. Countries are then scored against the criteria with the premise being that the highest scoring jurisdictions have the best opportunity for the deployment of a CCS project. The CCS Index demonstrates that countries with clear, long-term policy commitments to use CCS technologies as an emissions reduction method rank highly. Despite strong development trends in some regions of the world, the majority of countries cluster around the midpoint of the analysis, suggesting some progress towards enabling CCS development, but not yet enough to encourage wide-scale deployment. The successful deployment of carbon capture and storage as a means to mitigate greenhouse gas emissions requires the availability of significant geological storage capacity. Assessments that identify suitable sedimentary basins and their capacity are the first logical step in defining global carbon capture and storage potential. This paper presents a collation and summary of the current status of storage assessments worldwide known as the Global Storage Portfolio. 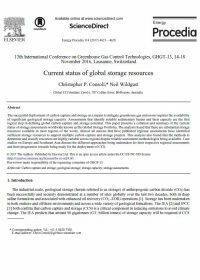 The analysis found that there are substantial storage resources available in most regions of the world. 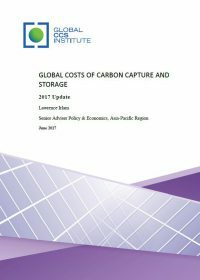 Almost all nations that have published regional assessments have identified sufficient storage resources to support multiple carbon capture and storage projects. This analysis also found that the methods to determine and classify resources are highly variable across regions despite reliable assessment methodologies being available. Case studies on Europe and Southeast Asia discuss the different approaches being undertaken for their respective regional assessments and their progression towards being ready for the deployment of CCS. This summary report presents data commissioned by the Global CCS Institute from Advisian (the consulting and advisory arm of WorleyParsons, a global engineering firm) of the current and likely future costs of CCS in power generation and industrial applications. The report provides cost estimates for CCS in seven industries, including power generation, iron and steel, cement and bio-ethanol production. Estimates are also provided for fourteen countries, including China, Germany, Canada, Indonesia, Morocco and South Korea. The Institute commissioned this dataset to provide an independent and up-to-date reference for various stakeholders wishing to understand the cost and performance of facilities fitted with CCS technologies, including transport and storage. Standardised designs for each facility have been used and costs for these are transposed from the reference location to different countries, reflecting drivers such as local ambient conditions, labour rates and fuel cost and quality. The resulting cost estimates therefore involve a degree of uncertainty that is typical for studies of this type, but provide a sound representation of the likely cost of CCS using today’s commercially available technologies, as well as cost reductions possible from learning-by-doing and by using better technologies that are currently in various stages of development. 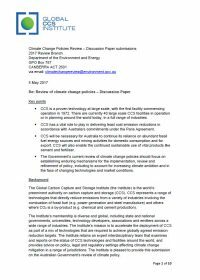 On 5 May the Institute lodged a submission in response to the Australian Government’s discussion paper on its review of climate change policies. This review is being undertaken at a critical time in the Australian energy and climate policy space, and is a stocktake of the Australian Government’s actions towards achieving Australia’s 2030 emission reduction targets and commitments under the Paris Agreement. The Institute’s submission points out the recent progress on large scale CCS facilities around the world and the important role of CCS in meeting Australia’s long-term emission reduction targets in a range of sectors. Central to this is providing policy parity to CCS, which will ensure emission reduction targets are met at least cost and with the optimal mix of technologies. The submission also makes broader recommendations for the Government’s review including the need to set legislated long-term targets that are supported by interim carbon budgets, periodic reporting of progress against targets and better coordination of state, territory and federal government policy.